A classic holiday film that continues to delight children and adults alike. Doris Walker is a no-nonsense divorced Macy’s executive who desperately searches for a new store Santa. She hires a kind but quirky old man named Kris Kringle who insists that he’s the real Santa Claus. Despite reassurances by Kringle’s doctor that he is harmless, Doris remains skeptical. Eventually, Kris Kringle goes to court to try and prove it. Is he the real Santa Claus? This is truly a perennial family holiday film. Charming, with a great cast, and well produced, Miracle On 34th Street reveals typical society and daily life in the 1940s. Kids today may not realize what an anomaly a divorced working mom was at that time. Natalie Wood plays a brilliant six-year-old. While some scenarios seem unreal, the story is so strong that it suspends reality. This movie is a true American tale. Although the Department Store originated in Europe, American cities, in their heyday, took it to a whole new level. In an era long before Malls, shoppers whether they lived in city, suburb, or country, would travel to their nearest downtown to do their shopping at one of these grand emporiums. It did not matter whether it was Detroit (JL Hudson), Philadelphia (John Wanamaker), Boston (Jordan Marsh), Chicago (Marshal Feild), every city had it’s signature store and it was as much an issue of civic pride as the baseball team was. When this movie was released (1947), Manhattan was to home to over one dozen grand department stores. Maureen O’Hara plays the haried Macy’s Personel Manager (it was not called “HR” yet), and she is found to be a bitter divorcee, and single parent (yes, even then people got divorced, and were single parents). John Payne courts her, and I guess you could say wants to rescue her, and Natalie Wood from their very insular world. However in the middle of all this Macy’s Santa winds up sending parents to, horrors, of horrors, Gimbels for better skates (and other toys), and for that matter any other store if Macy’s does not have it better, or cheaper. Needless to say Macy’s Toy Buyer freaks out big time, and Santa winds up in a court battle over his sanity. The print is presented in 1080p/AVC MPEG-4 with a 1.33:1 aspect ratio. For those wondering this is the black and white version of the film and the colorized version is not a part of this package. For completists they might be disappointed, but purists will happy. The print is not the best looking black and white film in high definition due to a few faults, but it shows what can be done to restore a classic. I found the print to be a bit on the soft and dull looking side. Albeit the softness, black levels are strong and consistent throughout. Details are on the average which I wish the image was much clearer. I am happy to report that this film has never looked this good with previous releases. The audio is presented in DTS-HD MA lossless 5.1 mix. The original mix is mono for this film but FOX has done a great job here bringing the film to life. Granted the surrounds do not add much to the soundfield as this is still a front heavy experience, there are discreet sounds coming through. Dialogue is clean through the center channel and sounds much cleaner than previous releases. 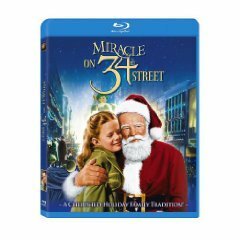 ‘Miracle on 34th Street’ is an excellent classic that has stood the test of time albeit a wonderful remake that was released in 1994. The film has never looked this good on home video considering that black & white films shine in high definition with the proper treatment. This is highly recommended for the entire family as a purchase. That is the suitable weblog for anyone who wants to search out out about this topic. You notice so much its virtually hard to argue with you (not that I really would need?aHa). You undoubtedly put a brand new spin on a subject thats been written about for years. Great stuff, just great!